In 2015 I took the plunge, downsizing my life to adapt to a new adventure. As I began the process of selling my business in early 2014, I began preparing for the life transition the change would bring. 2015 dawned with me living in a 3,000 square foot home with 2 garages, a workshop, a barn, and a chicken coop, all filled with treasures and tools and beloved belongings. As I rang in the new year in my new city in Seattle, “home” was now a 280 square foot studio apartment in the heart of downtown, 4 blocks from Seattle’s Pike Place Market. My journey isn’t all that dissimilar from the migration of many in my generation who, fed up with the rat race of trying to have it all, are transitioning into tiny homes. There’s no way to take this step too soon, in my opinion. 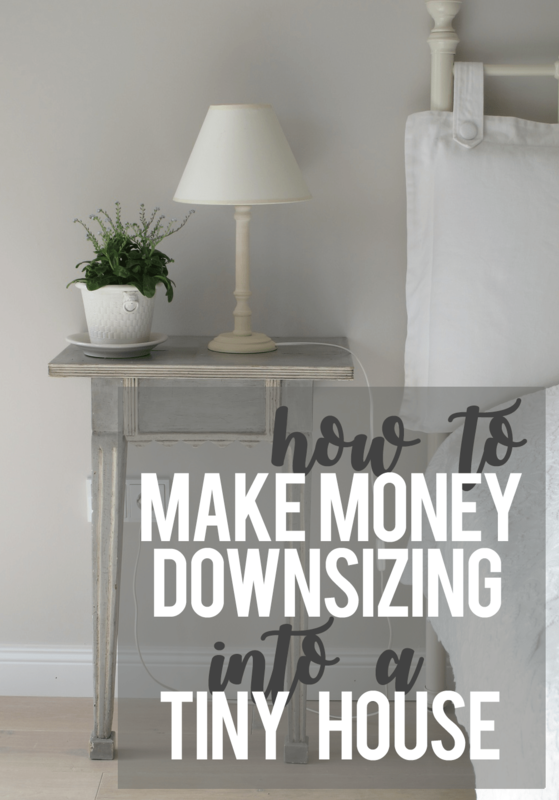 As you begin to toy with the idea of downsizing, investigate opening a flea market booth at a staffed flea market (business that allow individuals to rent a booth to fill with items to sell, and manage all the details for you for a commission of each purchase). Plan ahead, as you may have to wait on a waiting list for a booth to open. Make sure your flea market allows eclectic items- some markets prohibit items that are not vintage. In the process of downsizing you’ll have lots of valuable odds and ends you’ll want to have the option of selling in your booth. Flea markets are the best route to create income during your transition to a tinyhouse. As I downsized, I described my flea market booth jokingly to friends as a storage unit with a hole in the bottom. It was a handy place to store things I no longer wanted, and the checks as it emptied were fun and reinforcing. My flea market booth was ideal for helping me part with cherished possessions I simply didn’t need anymore. My favorite vintage embroidered American flag, for example, would have been impossibly painful for me to see someone carry off for $5 at one of the yard sales, but it was tolerable to sell out of my flea market booth for $50 after 6 months out-of-site waiting to sell in my booth. When it comes to reselling prime small and mid-size antiques and collectibles, still-in-demand used electronics and technology, and name brand clothing, eBay is theway to go. On eBay you can reach niche collectible buyers, and sell clothing and electronics to people willing to pay. For success using eBay to help you downsize, watch a few instructional youtube videos on maximizing eBay profits for many tips and tricks, pick a cloudy day and photograph your items outdoors, then line everything up you want to list and dedicate one or two days to getting it all online at once, so you can deal with packing and shipping in one several-day stretch the following week. If you itemize your taxes, donations of clothing or household goods can add up quickly to be a moderately sized write off- which though not technically a way to make a profit downsizing, is a way to wind up with more money in your pocket to pay for your tiny living adventures to come. Salvation army and goodwill will both provide, on request, itemized receipts for you to fill out, along with suggested values to list for items so you stay upright in the eyes of the IRS. To make filling out the receipt easier, make a tally sheet as you are loading bags or boxes to donate and then photograph the tally sheet with your phone when you are done so you have a digital copy. TIP: Habitat for Humanity takes a lot of items that thrift stores won’t (like construction leftovers, furniture, appliances, paint, etc). They’ll also send a crew to your home to pick up heavy items, if you call and schedule in advance. It goes without saying that a yard sale or two will be part of the process of downsizing to move into your tiny house. If executed well, yard sales can be really profitable! Social Media – As you begin organizing and pricing for your sale, take pictures of your boxes and heaps of sale items. Also take a photo of a piece of paper with the details of your sale written on it. Post groups of images (including the image with the details of where/when your sale is) to your facebook leading up to the sale and ask your friends to share and tag interested shoppers. Your friends are invested in your success downsizing and can help spread the word father than you think! Signage – A large sign for your front yard and signs on the nearest main roads will bring in a lot of people. Make the signs as large as possible, and use what you have. Magic marker on canvas works well for a giant yard sign between two trees. We invested in a large printed vinyl banner that read “Garage Sale Here. Friday – Saturday” and then sold the banner at the end of our sale! Craigslist – There’s no longer any need to pay for advertising for your sale, Craigslist is THE place to post your sale ads. Make sure to post by Wednesday of the week or your sale, as people begin looking at ads midweek to determine whether to plan to attend garage sales that weekend. Craigslist has another benefit you can use during your sale- which I’ll explain in the next point. Be sure and indicate in your Garage Sale advertising that you’re downsizing and selling lots of high quality items, tease buyers with the lure of better-than-average garage sale finds. TIP: as your yard sale traffic slows down, use your time wisely. Instead of trashing the leftovers or selling for desperately low prices, take your thinned-down belongings and begin adding pricetags for your flea market booth (adding, on average 50-75% to the garage sale price to adjust for the fees and convenience of flea market sales). Craigslist was my constant companion when downsizing from my 3 bedroom house on 3 acres into a tiny downtown Seattle studio. There are a few ways other than the obvious to use craigslist when downsizing. There’s a right price for everything – Craigslist is ideal for getting rid of stuff that (almost) no one wants. Adjust your price accordingly, and people will show up and pay money to haul off what feels like trash. Don’t assume that because you don’t want it, no one will. Always list for a price first, then adjust the price, then give away if there is no response. I might be the only person in the last 5 years to downsize without ever touching the book The Lifechanging Magic of Tidying Up, but I’m told that author teaches a variation on the love inventory, which I did in several phases during my downsize to tiny living. I did not find it necessary to touch everything. Almost any of us can go through a closet and upon a quick flip through the hangers pull a few items to get rid of without needing to thoughtfully consider their place or what they bring to our life- they’re simply no longer a good fit- physically or otherwise. My first pass was to conduct this quick survey on closets and cabinets, bookshelves and drawers. My first love inventory came later, as I packed to move in to my tiny home in Seattle. Walking through the 3,000 square feet of my home, I carefully considered each drawer contents, each shelf, each cabinet, and considered what items were essential- either for personal care or home maintenance (like basic tools and beauty products) and what items brought me enough joy to be an essential part of the voyage forward (like art). My transition to tiny living was slow and multiphased, and in that was a very kind way to make such a huge transition and something I recommend, if possible. My set up was nearly ideal. After reducing the contents of my house down to only things that were beautiful or functional, I collected my most dear possessions and moved into my tiny living Seattle apartment, while leaving my house furnished and functional as an an AirBnB. When I realized I could indeed survive in a tinyhouse, I listed my big old house for sale and continued operating it as an AirBnB while waiting for a buyer. Each vacation i would return to my house, run my fingers over the spine of books, take in the art left behind, and consider what I needed to carry with me into this season- each time returning with a suitcase of beloved items cushioned between layers of clothing. When I accepted an offer on the house, I returned one last time, conducted one last love inventory, before turning the contents over to an estate sale manager. I’m confident these trips back to survey and ask myself what mattered were deeply kind to my heart in the transition, and were what allowed me to move into a tiny home that’s full of beloved possessions, without regret for the things left behind. Facebook – I preferred to gift items to people in my communities, so Facebook was often the first place I went to give items away. A picture posted to my timeline usually resulted in a taker claiming it right away (my caveat was that folks could only claim if they could pic up within 24 hours, so as not to stall my process). In some areas, Buy Nothing groups on Facebook are a way to gift within your community and get to know your neighbors. Craigslist – I usually used craigslist’s “free” section in conjunctions with putting something on the curb. Unless it was heavy, bulky, or otherwise hard to move, I’d put items on my curb, sometimes for a day or two, before posting them on craigslist. Sometimes people naturally grabbed stuff from my curb, but about half the time I’d need to post a craigslist free ad to get and item to disappear. You may find, like me, that even after a yard sale and flea market, there’s a lot left. I’d spent a year slowly downsizing my belongings and moved into my microapartment when the estate sale finally happened. Since it had been an Air BnB, the house was still fully furnished with furniture, linens, dishes, and appliances. My small town real estate agent offered to manage my estate sale for a percentage of the profit and I agreed, knowing how emotionally difficult it would be to part with items I loved that would not fit in my tiny living setup. Having someone else manage the last steps was wise. With no emotional connection to the contents, my estate sale manager was able to discount prices as needed as the weekend of the estate sale progressed so that there were only a few odds and ends left at the end. TIP: If you used a flea market to sell high value items during the transition, the estate sale is a great way to closeout your booth with no lingering items. Just transfer the remaining contents of your booth to the estate sale manager before the sale. What’s left after flea market, yard sale, ebay, and estate sale probably won’t be much, but it might be enough for a few boxes dropped off at an auction house. Don’t assume your last few boxes are worthless, it’s worth taking them by an auction house.